Offshoot of this old thread. Anno mentioned Shinji's inability to commit suicide. Ep4: He's sitting on a cliff famous for such according to the script. Ep25': His head's wet; he's at the lake he talked with Misato at the night before. Ep26': Instrumenality=allegory for suicide, nuff said. What was he doing at the start of EoE? I don't think it's a stretch he tried to die like that, given everything up to that point. IIRC, wasn't the general consensus that he tried drowning himself? I believe it was, though something script-wise instead of just evidence with his "I want to die" lines (words to Misato), resisting the JSSDF, and mourning Kaworu would be nice. Wow, so Shinji tried to kill himself in episode 4. Now gf/I thought about that and she said "I thought so then it turned out to be a beautiful scene." So when he was standing beside the water, he tried to drown himself? Shinji just sat by the cliff in Ep4. With EoE, Misato left Shinji alone all night or he returned to the lake the next morning then did the deed with dunking his head. This is all before he sees Asuka by the way. Now, is there anything to suggest the shots of Misato's gun and her looking exhausted/upset in 23' or 24' (I forget which episode, but it's after Misato says she accepted Kaji's feelings for her) implies Misato entertained the thought of suicide (before she came to terms Kaji's death)? Otakon 08 Ikari wrote: Wow, so Shinji tried to kill himself in episode 4. Now gf/I thought about that and she said "I thought so then it turned out to be a beautiful scene." Otakon 08 Ikari wrote: So when he was standing beside the water, he tried to drown himself? Sitting and waiting and doing everything but shouting "Do it to me!" while the GeoFront is being overrun probably counts as well. Indeed, he might have felt disappointed when Misato showed up to save him. Never knew about ep4 and suicide and tbh never really wondered about the wet hair. So he thought about drowning himself but did not, understandable. I find Shinji's inability to commit suicide much more interesting than the fact that he attempted it. Why can't he do it? Is it due more to a physical or a mental/psychological inability? Probably nothing that complicated, he's probably just too scared to go through with it all the way. Don't most attempters find themselves unable to do it? Rodeo wrote: Don't most attempters find themselves unable to do it? I looked up the numbers and you are correct; the number of unsuccessful attempts greatly outweigh the number of successful suicides. So is Shinji, as Anno has stated, truly unable to commit the act or is his "attempt" more of a cry for help? I like to think that Shinji is so helpless and incompetent that he tripped into the water on accident, tried to take suicidal advantage, and failed. 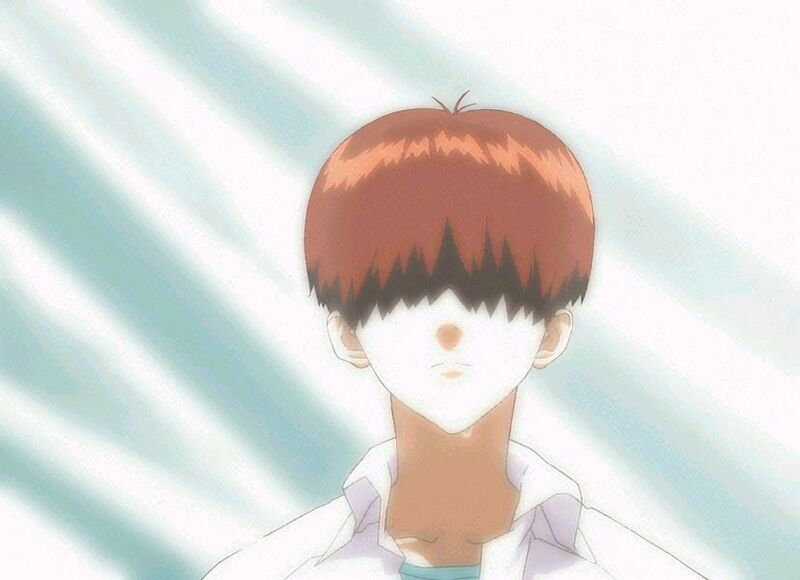 You're all reading way too much into a shot of Shinji with his bangs covering his eyes. this reminds me, when I was younger, I used to think about suicide quite a bit. Mostly I would think about what would happen if i were to do something resulting in my death, such as stepping off a cliff or into traffic. I was never really suicidal, but it was something that I thought about quite a lot for a time. I remember specifically hiking to the top of a cliff in the Appalachian mountains with my family when I was about 11. I started thinking about it, and actually became quite upset. Tines: Thanks for the image link. Luc: Then why is his head all wet? I seriously doubt it's just from the heat that day. DAVEvangelion wrote: So is Shinji, as Anno has stated, truly unable to commit the act or is his "attempt" more of a cry for help? I say both; based on personal expereince. And he's unable to go with accepting Instrumenality later on, he says it feels wrong to him, which is telling. Also, I know Rebuild usually goes in the subforum, but no input on my 1.0 thoughts? Possibly. Also didnt he walk up to cliffface or something like that in Episode 4 before he ran into Kensuke? Great Genius Shinji-Sama wrote: Possibly. Also didnt he walk up to cliffface or something like that in Episode 4 before he ran into Kensuke?